It is the turning of a New Year, and my mind turns to tanks. One reason is that I often associate this time with Gen. George S. Patton, thinking of the Third Army breaking the siege of Bastogne the day after Christmas during the Battle of the Bulge. 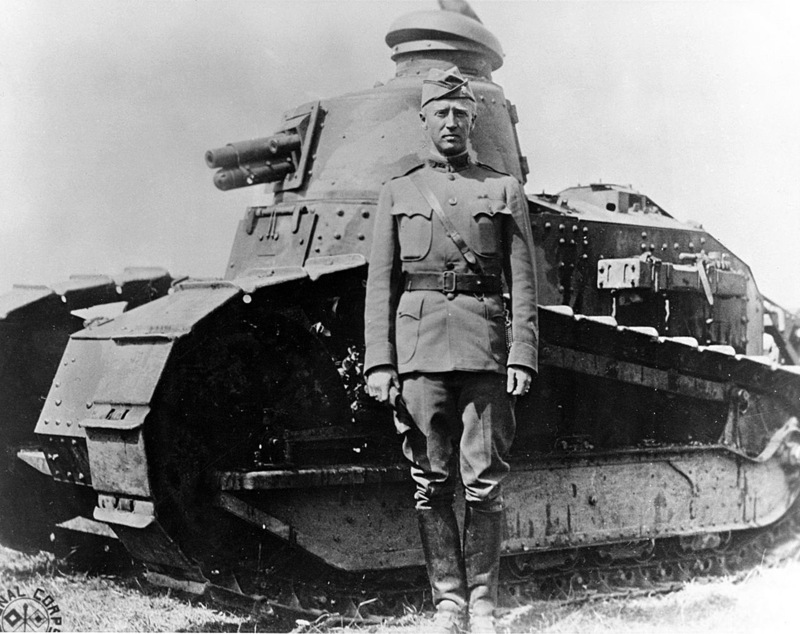 Lt. Col. George Patton stands in front of a French Renault tank in France during the summer of 1918. Another reason stems from a comment made at the Association on the U.S. Army’s Army Autonomy and AI Symposium and Exposition in late November. During a discussion about communication between autonomous vehicles, one panelist stated that the most important development for the tank was the radio. He said tanks were valuable but isolated when they were first introduced in World War I. When radios were added, armored attacks became coordinated – and transformed warfare. While some may argue with the first point, there is no doubt about the second. The AUSA Book Program has many titles that make the case. As noted above, tanks got their start in the First World War, helping to break the stalemate of trench warfare. The war ended before the United States fully developed their armored forces; only three tank battalions saw combat. But the Army recognized their potential and asked the officers to supplement official records with their personal notes on their experiences. Pershing’s Tankers: Personal Accounts of the AEF Tank Corps in World War I collects the best, including several from a young Col. Patton, to reveal the insights of those on the forefront of a new mode of warfighting. Patton went on to find armored fame in the next war. His relief of Bastogne is detailed in Advance and Destroy: Patton as Commander of the Bulge, and one of his intelligence officer gives a unique view of the general in Forward with Patton: The World War II Diary of Colonel Robert S. Allen. The Germans, of course, were a big part of the armored picture in WWII. Their early successes are documented in The Blitzkrieg Legend: The 1940 Campaign in the West and the newly translated Panzer Operations: Germany’s Panzer Group 3 during the Invasion of Russia, 1941. The tide began to turn against the Germans on the Eastern front at the Battle of Kursk, as detailed in the aptly titled The Battle of Kursk: The Red Army’s Defensive Operations and Counter-Offensive, July–August 1943. That book was an internal study of the battle from the Soviet General Staff. The Wehrmacht general Otto Heidkämper offered an insider’s view of a subsequent German defeat in Vitebsk: The Fight and Destruction of the Third Panzer Army – now available for the first time in English. Thanks no doubt to scores of WWII war movies, it is easy to envision American tanks moving across the battlefields of Europe. It is a little harder to picture them in the jungles of Vietnam, but troopers were indeed fighting in tanks and armored cavalry assault vehicles in that war. Danger’s Dragoons: The Armored Cavalry Task Force of The Big Red One in Vietnam, 1969 tells part of that tale. A few years later, 1973’s Yom Kippur War offered many valuable lessons for a U.S. Army looking to re-examine the way it fought. The armored branch paid particular attention – in one month of fighting the Israelis and the Arabs lost more tanks than the Americans had across Europe. Details of those lessons can be found in At the Decisive Point in the Sinai: Generalship in the Yom Kippur War and Inside Israel’s Northern Command: The Yom Kippur War on the Syrian Border. A revitalized Army proved itself in the Gulf War in the early days of 1991, where the ground campaign featured some of the largest tank battles in American history at Norfolk, Medina Ridge and 73 Easting. The commander in chief was the recently departed George H.W. Bush – providing yet one more reason why my thoughts have turned to tanks for the new year. To order copies of these great tank titles, please visit www.ausa.org/books.